If Irish rock band Thin Lizzy were only to be ever known for “The Boys Are Back in Town,” especially here in the States, that is accomplishment enough. But you would be selling yourself short because there’s more to that band’s music than just that one song. And Jailbreak, their 1976 album, is proof of that. Thirty-five years since its initial release, Jailbreak still has that swagger, anti-authority rebellious, balls-to-the-wall attitude, which is the theme of this record. There’s rockers a plenty here with the title cut, “Warriors,” “The Boys are Back in Town,” “Cowboy Song” and “Angel from the Coast”; other songs show a more reflective but nonetheless passionate side of the group as in “Fight or Fall” and “Running Back.” To a casual listener, some of the lyrics like “Romeo and the Lonely Girl” seem to evoke Springsteen–the working-class sensibility. “Emerald” closes the album on a dazzling note thanks to the twin guitars of Brian Robertson and Scott Gorham. But certainly the visionary genious of the late singer/bassist Phil Lynott carries through this record, a testament to his passion and attitude. 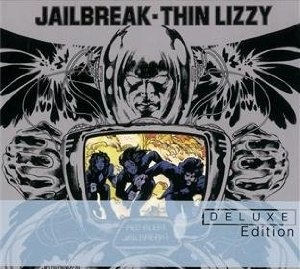 For those who are perhaps getting into this seminal ’70s hard rock band’s music for the first, Jailbreak is a good start. This deluxe edition also contains remixes of several songs including “Boys” as well as tracks from BBC Sessions.